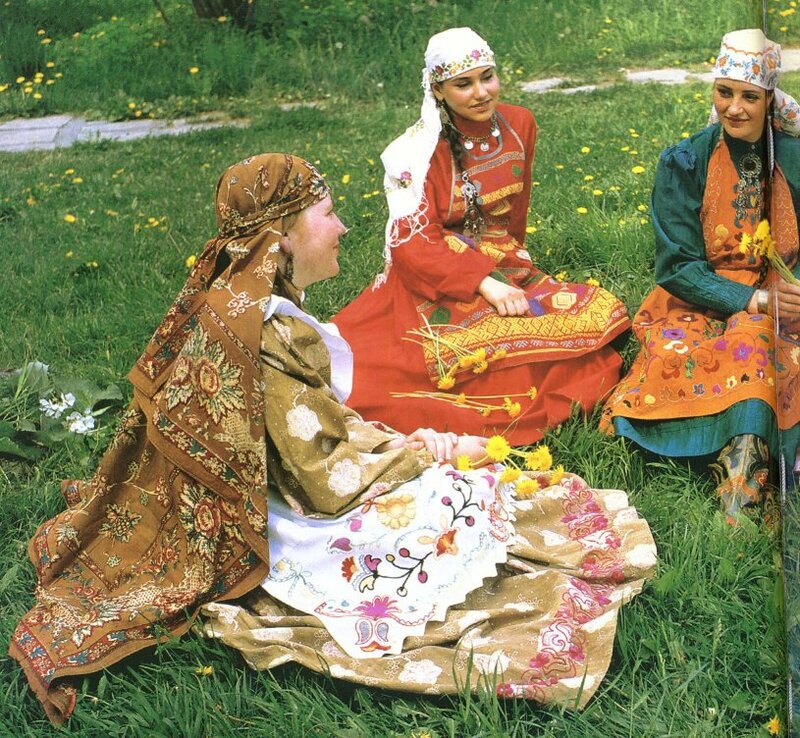 Today i will continue to talk about the costume of Tatarstan. For location and a bit of history of the Volga Tatars, see my first posting about them. 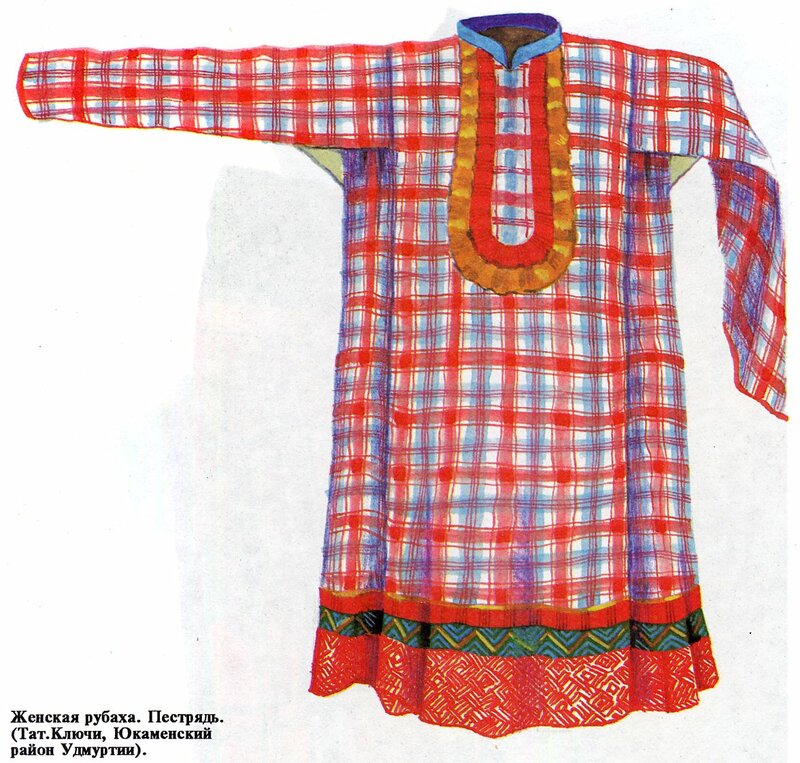 So far, i have presented the town costume, which is what one primarily finds presented in Tatar sources. Let us start with a photograph depicting a village wedding costume. At first glance there seems to be little new.The woman would of course try to dress up as much as possible, and this generally means putting on a town costume if she can afford it. The headdress she is wearing is yet another type of Kalfak, short and flat, almost resembling a man's cap which is worn with a shawl over it. ﻿Often, as in this case, the shawl is made of a very fine knit. We see the man is choosing to wear his kamzul open. This is the only photo i have in my sources that show this, but the stage presentations which i have seen all choose to dress the men in open vests, similar to the women's. He is wearing typical peasant clothing otherwise, plain black boots, and wedding footcloths, ayak cholkaulary. These are the typical foot coverings of much of eastern Europe. Knitted stockings were known in the Balkans, Baltic countries and Scandinavia. In most of the interior, woven rectangular pieces of cloth, often made from old worn out shirts, were folded and wrapped around the feet, and then tucked into boots or held in place with laces from postoly [moccasins], or lapty/lychaky [shoes woven from birch or linden bark]. The Soviet Army used footcloths untill quite recently. These are unique in that one edge is specially embroidered in chain or tambour stitch, which is made to hang over the tops of the boots. 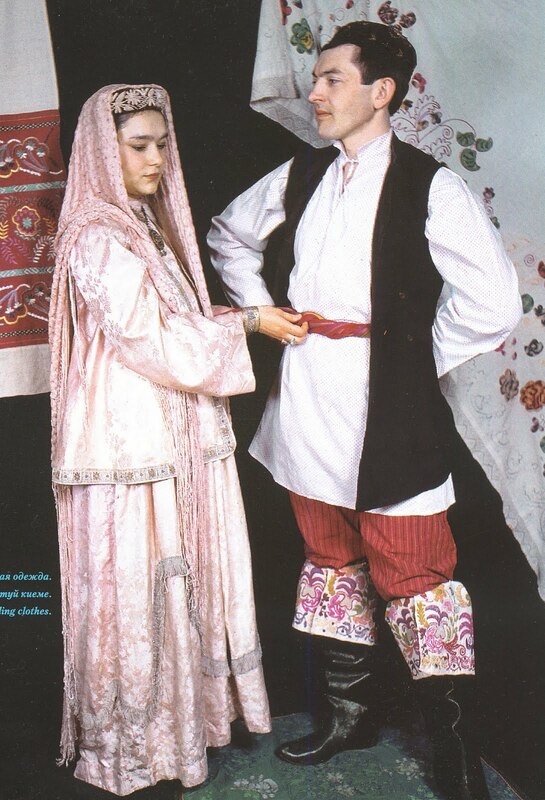 This is a uniquely Tatar tradition, and he only wears them like this on the actual day of the wedding. They are traditionally a gift from the bride to be, and often handed down in families. Here is the more typical day to day dress of the village Tatar woman. As you can see, it greatly resembles the city costume. Dress of rather plain store-bought cloth, leather mosaic footwear, headband with kalfak, earrings and braid ornament. Two things stand out. She wears no vest, no kamzul, and she is wearing a richly embroidered apron with a bib. 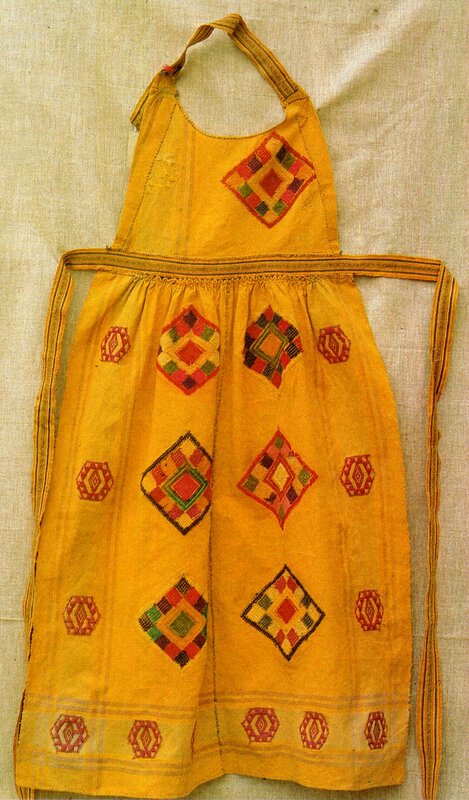 The apron, in the village costume became a focus of embellishment, being either richly embroidered, woven with bright designs, or made of colorful printed cloth. I suspect the apron was adopted by the Tatars after their arrival in the region from the other peoples living in the area. It makes no appearance in the city costume at all, and it often greatly resembles that of their neighbors, particularly the Udmurt. 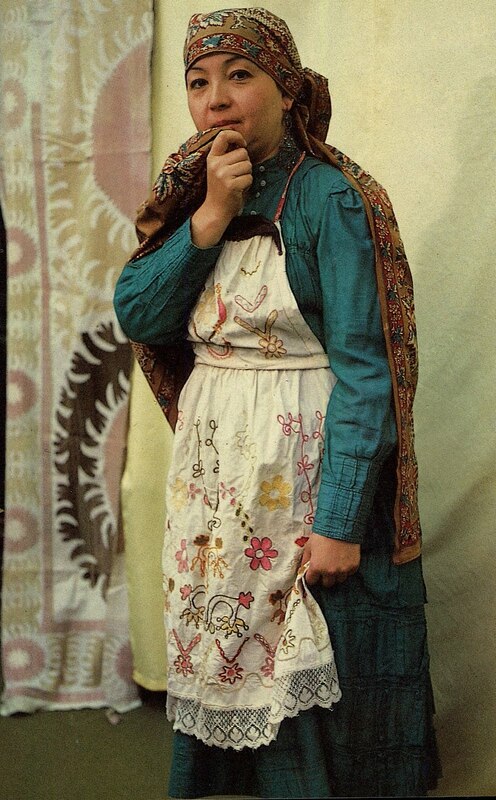 The chain stitch embroidery is a heritage from central Asia, resembling that of the Uzbek.﻿ Here is another peasant woman in an embroidered apron. You will notice she is not wearing the Kalfak at all. Instead she has a large printed kerchief or shawl tied in a very specific fashion around the head and falling down the back. This is the typical headgear of the village woman. Again, you can see that her dress is made of plain bought cloth. Here is another girl with a rather more recent cut to the dress, featuring the peaked shoulders that became so popular in the early 20th cent, boots of leather mosaic, and rather less jewelry than a townswoman. This is clearly a dress up outfit. In addition to dresses of bought cloth and aprons with chain stitch embroidery, village women also engaged in weaving their own cloth. This varied from place to place, and was rarer in more recent times. 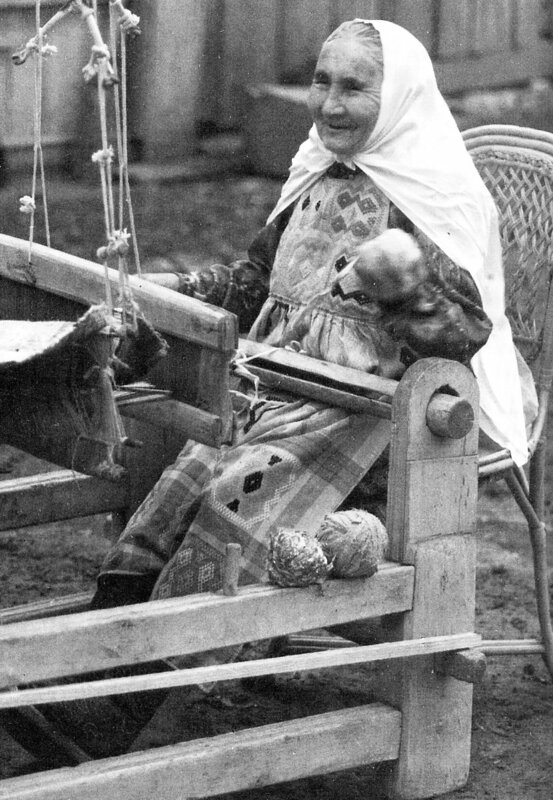 Here is an older Tatar woman at her loom. Her dress is shorter, more practical for working, she appears to be wearing boots, and would certainly be wearing pants under her dress. 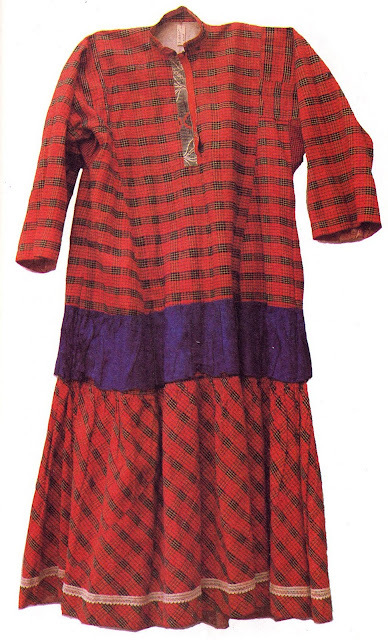 The dress was sometimes made from patterned homespun, as in the following examples. 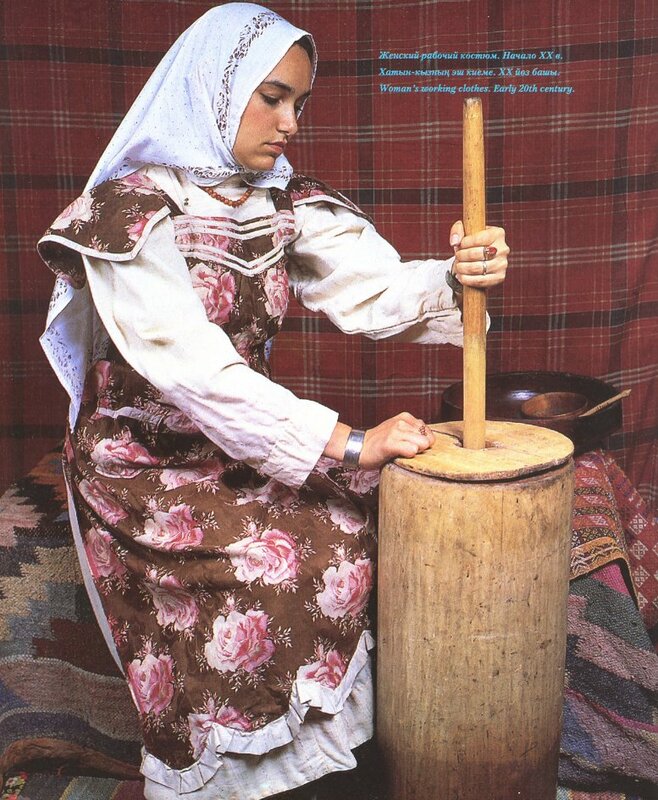 The cut is one typical of the Tatars, but they have picked up the love of plaid which is general in the region among the Finnic peoples. This dress is also finished off with patterned woven strips on the bottom. Hre is another example. ﻿Here you can see that the top is of the traditional cut, but the skirt of the dress has been made quite a bit fuller, and has been attached on the bias. 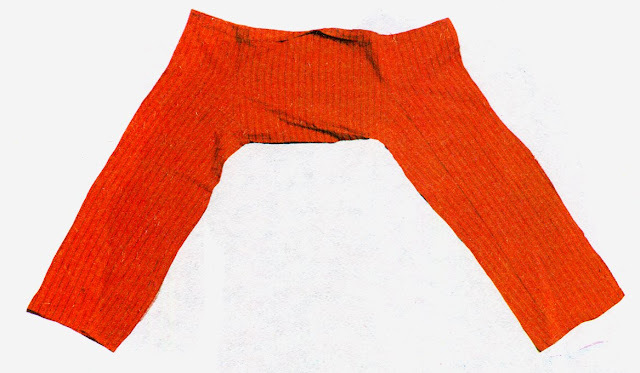 Men's pants were also made of homespun. If you take another look at the woman above who is weaving, you will see that although her dress may be of printed cloth, her apron is clearly home woven with a patterned design. This type of apron was common in the region, especially among the southern Udmurts, but it was worn by village Tatar women as well. Here are a couple of examples. 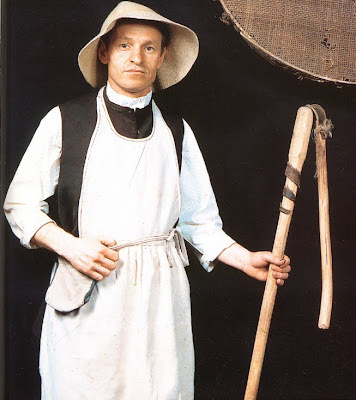 The men, as is usually the case, only wore aprons as part of their working attire, for practical reasons. ﻿The cut is essentially the same, however. 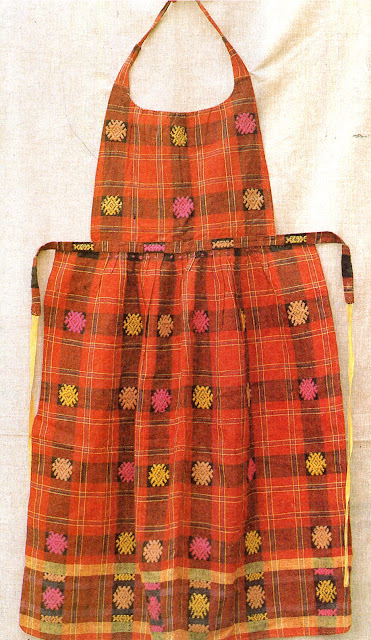 For the village girl, the apron became a focus of embellishment, and was part of her dress up attire, whether woven or embroidered. The headcloth also was sometimes embroidered, as we see here. The dress was made of printed cloth when that became available, sometimes embroidery was worked over the print. In later periods, the bib of the apron was sometimes widened, and a ruffle added. And when the apron itself was made of printed cloth, the desire to embellish it was still there, taking the form of ruffles, ribbons and scalloped edges. ﻿This is the costume that you see, [more or less] presented by perfoming groups. I would like to state here a warning. Stage costumes are STAGE costumes. There are groups which attempt to faithfully present the costume tradition of their people. There are many groups, however which exaggerate certain features, making skirts fuller, so they can swirl, shorter, so the audience can gawk at the girls' legs, the ornamentation coarser, so they can be more easily seen from the audience, [and be easier and quicker to make], and often lots of glitz, tinsel and glitter. And some performers, particularly singers or musicians, invent a stage outfit that is only loosely based on tradition, and is only intended to be flashy and attention getting. Do not assume that an ethnic person on stage is even attemping a true representation of ethnic costume. Stage costume has its own function. This first one is not too bad, the enhancement being limited to shortening the girls' skirts, shrinking the aprons and adding glitz to the guys' vests and shirts. Here is a group presenting a very nice dance. They have put black embroidered sashes on the men, the origin of which i am unclear on. the women's dresses have been made much much fuller, and only vaguely resemble those above. These are stage costumes. This last group is attempting a very flashy glittery version of the town costume, complete with faux kalfaks on the women, silver lame, and huge sequins everywhere, on the singers. The dancers come out with a version of the village costume. The skirts enormously enlarged, with Izyu, but no vest or apron on the women. Quite a spectacle. Stage costume has its own function. I hope you have found this interesting, and as always, thank you for reading. As for now I'm writing mostly about reconstructins of mans costume, as it is simplere. We do not have extant peasant costumes from 17th cent so we are trying to reconstruct them according to folk costume analogies etc. I think she is ruthenian, and wears simmilar jacket. Its fullnes, shape, arms - all seems to fit. Do You think it could be the same? Do You have any patterns for this coat? I'll be thankfull if You can e-mail me (adress is in my blog).